If you haven’t heard of my JUST SAY NO TO NUGGETS campaign, then I will fill you in! Commercial chicken nuggets are one of my pet hates. They contain so many artificial ingredients, chemicals and questionable bits of the chicken! 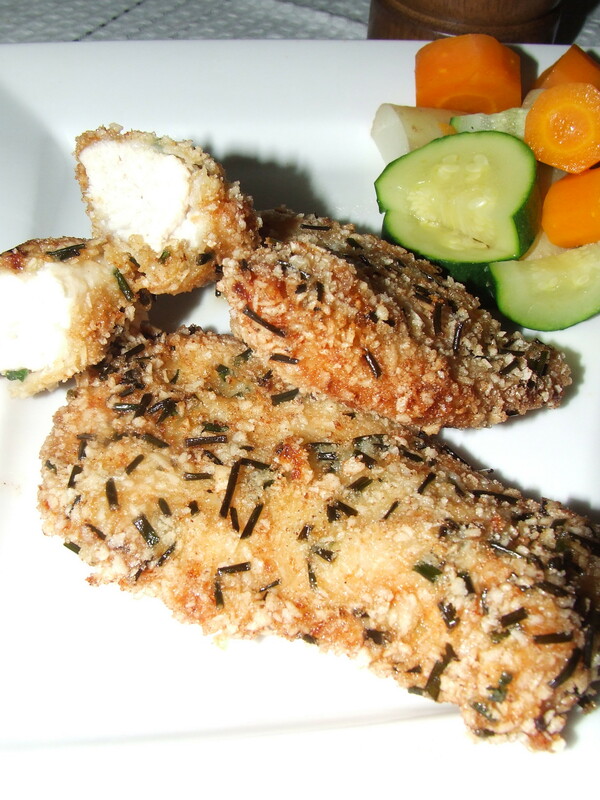 Nuggets are such a favourite with kids and a quick, easy standby for mums. BUT, in less than half an hour, you can prepare your own at home, with quality ingredients! I would encourage everyone to just say NO to nuggets and try some of my yummy ideas instead. Click here to see some more recipes! 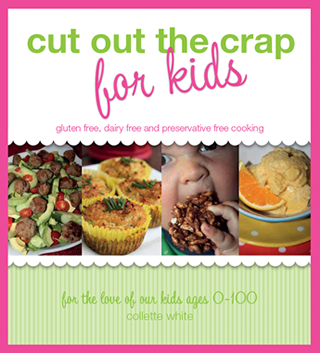 Today I am teaming up with the gorgeous Collette, author of the Cut out the Crap cookbooks to bring you some more ideas on how to make your own chicken nuggets at home. Collette kindly offered to share one of her ‘chicken nugget’ recipes using rice crackers from her first cookbook, Cut out the Crap. 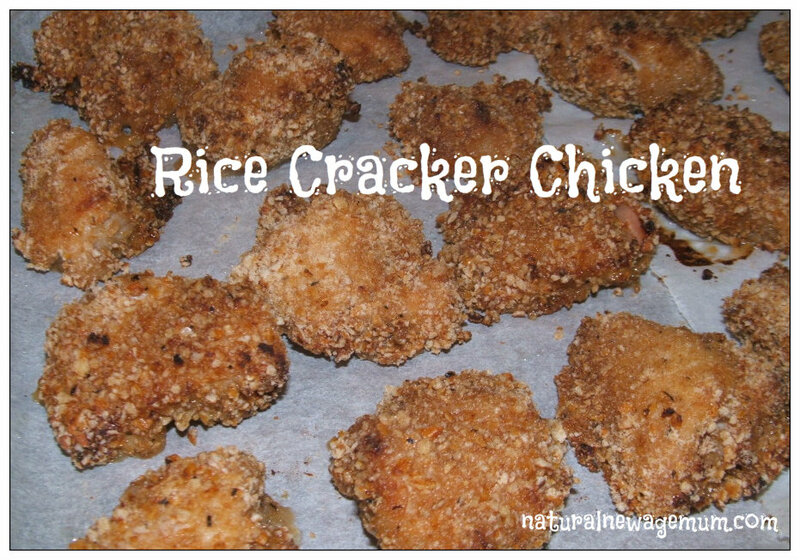 I also had a rice cracker chicken recipe to share, so today you get my version as well! Here is my Rice Cracker Chicken. It is gluten-free, dairy-free, additive-free and egg-free. Super quick and super yummy! For the healthiest option, use brown rice crackers with no artificial additives (read the back of the packet). Many rice crackers contain MSG and lots of numbers, so be vigilant! I don’t add seasoning as the crackers are usually salty enough, but you could always add some dried herbs if you like. Crush the rice crackers in the thermomix, food processor or use a rolling pin. We want the size of breadcrumbs, not a powder, so go easy on the pulse button! Cut the chicken into bite size pieces or strips (whatever takes your fancy). Chuck them into a bowl, add the honey and mix in well. Put the rice cracker crumbs on a plate and roll the chicken in them, piece by piece, pressing the crumbs on firmly. Place on a baking paper lined tray. Spritz with oil (I use a glass oil sprayer with grapeseed oil). Bake in a hot oven, 200oC for about 10-15 minutes, depending on how big your chicken pieces are. YUM! I think these might be my favourite so far. The hint of honey is so delicious! Using a blender or food processor, process the whole packet of rice crackers until fine crumbs form. In one bowl whisk the egg and rice milk. In another bowl, add the rice cracker crumbs, chives and sea salt. Mix well. Cut each chicken breast into quarters. Make one cut down the length to make it thinner, and one across to make it smaller. Working with one piece of chicken at a time, dip it into the egg mixture, then into the crumb mixture. Press the chicken down into the crumb mixture, so a good coating is formed. Set aside on a plate until ready to cook. Cook chicken schnitzel on a medium heat for 3-4 minutes either side, or until the chicken is thoroughly cooked and the outside is golden. It is such a thrill for me to connect with other mums also interested in feeding our families healthy food. Collette is a mum of four (where does she find the time to write cookbooks?!) with an interesting story about how she got into healthy cooking. In the last few weeks, I have been cooking out of Collette’s books and I am very impressed. My wheat-free daughter is having fun with all the healthy gluten-free muffins and cakes! My favourite so far is the Orange and Rosemary Chicken. 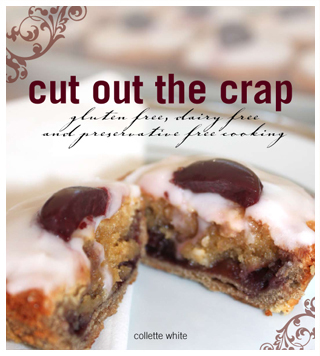 All of Collette’s recipes, in both books, Cut out the Crap and Cut out the Crap for Kids are gluten-free, dairy-free and additive-free. The recipes are healthy, simple to make and family friendly. The only thing I swap around is the sugar for natural sweeteners, but that is easy enough to do. You can check out more of Collette’s recipes at her website, blog or Facebook page. Coming up on the blog, I will also have a chance for one of you to WIN both cookbooks as well. Make sure you are signed up to get the emails so you don’t miss out! So, are these recipes inspiring you to just say NO to nuggets? Would you give them a go? Remember to check back with us and tell us what the family thinks! I have been using rice crumbs (from the gluten free section at the local coles) which have no preservatives in them with egg and GF flour. Cut your free range chicken into nugget sized bites and crumb as per normal. Gorgeous. I hate to buy nuggets and my kids love mums nuggets, we will have schnitzels on the day the kids have nuggets. We use quinoa flakes here and bake the chicken in the oven. A simple egg wash, over sliced chicken and then we press seasoned qunioa flakes into the chicken. Spray with oil spray and bake for 15 min. what brand of rice crackers did you use?